The government has announced an umbrella scheme, aptly titled Pradhan Mantri Annadata Aay Sanrakshan Abhiyan (PM-AASHA) to enable farmers to realize the minimum support price (MSP) for kharif crops. The price support scheme, price deficiency payment scheme, private procurement, stockist scheme and procurement of wheat and rice for public distribution (through Food Corporation of India and state governments) have their own merits and challenges. However, there is another option that can benefit farmers by directly linking them to markets. It is the warehousing receipt system and it has not received due attention from policy makers. In previous years, we have seen market prices crash during arrival season. Later in the year, when farmers sold their produce to traders, the prices showed a rising trend with traders cornering all the profit. For example, soybean prices in Madhya Pradesh in the peak arrival month of November 2013 were ₹ 36,100 per tonne. They rose to ₹ 39,860 per tonne by June 2014, recording an increase of 10.41%. From 2014-15 to 2015-16, however, the prices rose by only 4.22% and 3.96% respectively, due to a crash in global prices of soybean and demonetization. FY 2017 and 2018 have been exceptional years when prices of several agricultural commodities did not rise even in off season. In order to develop and regulate warehouses and make provisions for negotiability of warehouse receipts, the government enacted the Warehousing (Development and Regulation) Act (WDRA), 2007. WDRA registers warehouses that are willing to issue negotiable warehouse receipts (NWRs). Warehouses meeting certain quality standards can issue NWRs, which carry a guarantee that the holder of the NWR will be delivered the quality and quantity mentioned in it. In September 2017, WDRA licensed two repositories for facilitating the issue of NWRs in electronic form (e-NWR). The WDRA rules, notified in February 2017, provide that it will notify a date after which NWRs will only be issued in electronic form. But this notification is yet to be issued. This warehousing ecosystem has the potential to create a national market for agricultural commodities by enabling farmers and traders with access to each other across India. It can also reduce price volatility by integrating warehouses in producing areas with markets in consumption areas. An e-NWR has enormous potential to facilitate seamless trading of agri-commodities across states. Since the issue of an e-NWR is not yet compulsory, only 140 out of 735 warehouses registered with WDRA have done it so far. The full potential of national agriculture market (e-NAM), therefore, is still unrealized. There are about 55,000 warehouses in the country out of which only 735, having a capacity of 6.6 million tonnes, have valid registration with WDRA. 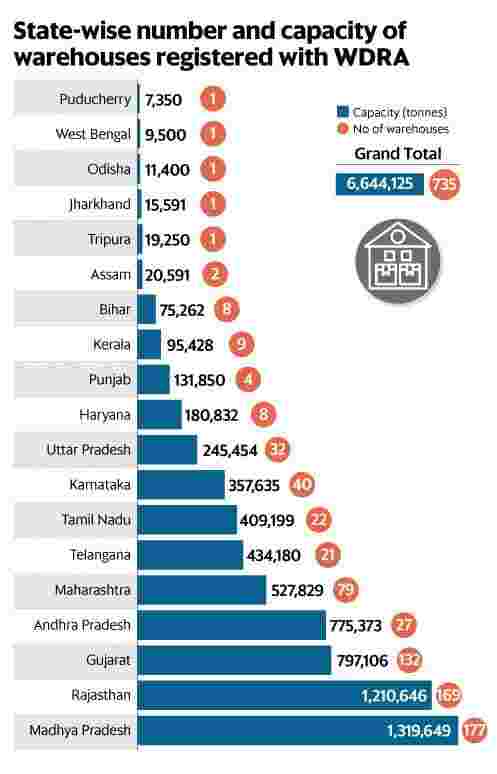 About 50% of this capacity is located in Gujarat, Madhya Pradesh and Rajasthan, while Jharkhand, Odisha and West Bengal have just one registered warehouse each (see graph). In unregistered warehouses, quality specifications are not standardized. A farmer or trader who keeps his produce in such warehouses is issued a warehouse receipt (WR) in physical form. He can take a pledge loan from a bank against this receipt but it is non-negotiable and he cannot transfer it to another person. The farmer/trader has no protection against the warehouse in case of deterioration in quality of produce or pilferage by the warehouse. The produce stored in such warehouses is generally managed by collateral management companies and they arrange pledge loans against such WRs. The trade estimate is that more than ₹ 40,000 crore is advanced as pledge loans against WRs issued by unregistered warehouses. However, hardly any pledge loans have been sanctioned in any of the eastern and north-eastern states, from Bihar to Tripura. On their Kisan Credit Cards (KCC), small and marginal farmers can avail of post-harvest loans of up to ₹ 3 lakh for storage against NWRs. The government provides subvention of 2% per annum. However, 3% incentive for timely payment of crop loan is not available for post-harvest loans. Thus, loans are available to small and marginal farmers for post-harvest storage for six months at 7%. The government spent ₹ 15,698 crore in 2017-18 towards interest subsidy on short-term crop loans but the amount of interest subsidy for post-harvest loans against NWRs is not known because such data is not released by the Reserve Bank of India. As few small and marginal farmers have any surplus produce, it is possible that hardly any would have availed of the benefit of interest subsidy for post-harvest storage. Since interest subvention is not available to farmers with higher land holding, they have to pay 9-10% interest on pledge loans. The registration of warehouses with WDRA is not compulsory and banks consider WRs issued by non-registered warehouses good enough for pledge loans through collateral managers. Banks do not given any concession on interest rates on loans against NWRs issued by WDRA registered warehouses. In the meantime, collateral management companies are flourishing and most warehouses see no reason to be part of the WDRA ecosystem. If the objective of e-NAM is to be achieved, the government should make it mandatory that all warehouses of above 2,500 tonnes are registered with WDRA and they issue only e-NWRs. The government should also extend 2% subvention to medium and large farmers for pledge loans up to ₹ 5 lakh raised against e-NWRs. PM-AASHA alone cannot deliver MSP to all farmers. Market-oriented schemes such as warehousing need to be aggressively promoted so that farmers can also benefit from the rise in prices in the off season. Siraj Hussain is visiting senior fellow at ICRIER and former agriculture secretary to the government of India. Comments are welcome at theirview@livemint.com.